Notifications keep you in touch with your friends, breaking news, the weather, and much more, but you don’t necessarily want them arriving all through the day—when you can be interrupted at any moment, your attention and productivity are always going to take a hit. Here’s how to get notifications delivered on a schedule of your choosing. And if you don’t think this is for you, you should know that just receiving a buzz or a beep on your phone is enough to create aserious distraction—even if you don’t check the notification right away. If you want to stay focused, you need to rein in the alerts hitting your phone. The most basic option is to flick your phone into airplane mode at the start of the working day and then back out again when you’re heading home—perhaps with a break for lunch as a treat. What puts most people off doing that is they can’t be contacted in an emergency, even though society survived just fine before smartphones arrived, but it’s one option that might work for you. 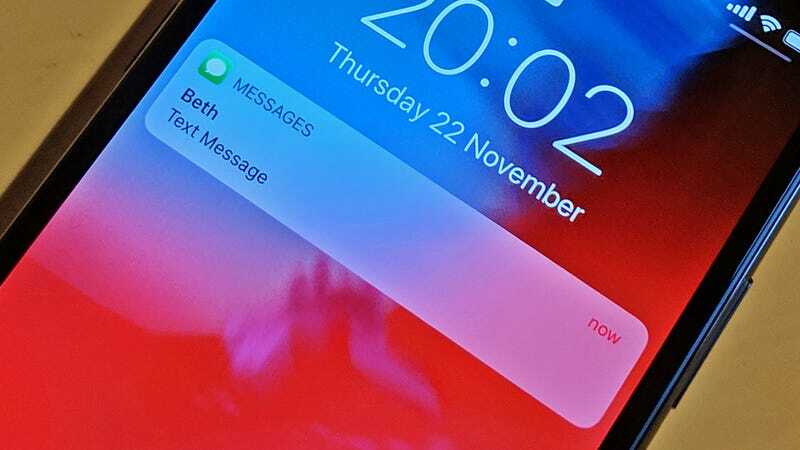 Both Android and iOS have upgraded their Do Not Disturb features recently, which means you get more control than ever before over when and how your alerts come through. If you block out alerts from all your apps while still letting emergency calls and texts through, then this is the most straightforward way. On Android, open Settings then head to Sound and Do not disturb. You can activate the mode straight away by tapping Turn on now, but for our purposes you want to select Turn on automatically and configure the hours you don’t want alerts to come through—for example, you could activate Do Not Disturb during the working day every weekday. Do Not Disturb on Android. The rest of the options on this menu screen let you configure how Do Not Disturb works: Calls and Messages, events & reminders let you set exceptions for the mode so that you can allow through calls and texts from starred contacts (your kids or your partner maybe). You can have notifications appear silently on the status bar (without waking the screen) or have them blocked entirely, using the Sound & vibration and Notifications options on the same menu. There are also options for allowing alarm and media sounds, so you’ve got a lot of customization choices you can set as preferred. Over on iOS the available settings work along similar lines. Tap Do Not Disturb in Settings: The top option lets you turn the mode on and off manually, but you can also toggle the Scheduled switch to on to have Do Not Disturb work on a timer. Use the options underneath to set your quiet hours—unlike Android; iOS only lets you set one scheduled Do Not Disturb time. Tap Allow Calls From to give certain people the privilege of breaking through the Do Not Disturb wall you’ve set up. iOS lets you allow calls from contacts marked as favorites, or from any custom group of contacts you’ve set up. Do Not Disturb on iOS. You can allow texts and calls from certain contacts through as well, though it’s not immediately apparent how to do it. Go to Contacts, tap on a name, then choose Edit. If you pick Ringtone or Text Tone, you can then select Emergency Bypass to allow calls or texts from this person to work even when Do Not Disturb is switched on. And finally, you can access Do Not Disturb from Quick Settings in Android (swipe down from the home screen with two fingers), or from the Control Center in iOS (swipe down from the top right or swipe up from the bottom on older iPhones). If you tap and hold the Do Not Disturb button in the iOS Control Center, you can mute notifications for an hour, until the evening, or until you leave your current location. Maybe you want to bundle up notifications from certain apps to arrive at a certain time, while allowing notifications from other apps to arrive as normal. This is possible, up to a point, by editing the options inside individual apps—though most apps would rather not let you interrupt the flow of alerts. Turning notifications on or off completely for individual apps is easy enough: Pick Apps & notifications then a specific app in the Settings app for Android, In iOS, select Notifications and then a specific app in the Settings app. You’re probably familiar with the idea of muting conversations, which is available in just about every messaging app out there—for chats where you’re getting too many alerts at once, you can mute them temporarily. This works on a chat-by-chat basis though, rather than the app as a whole. Take WhatsApp, for example: Tap the menu button (top right) inside a conversation, then choose Mute notifications to put a block on them for eight hours, one week, or (!) a year. In Facebook Messenger, long-press on a conversation title then choose Mute notifications—here you get a lot more in the way of options, from For 15 minutes to Until I turn it back on. In Gmail for Android and iOS, you can snooze individual conversation threads by tapping the menu button (top right), then Snooze—your choices are Later today, Tomorrow, This weekend, Next week, or a date and time of your choosing. Unfortunately, there’s no option to apply this snoozing across the board, though Boomerang Mail will do the job for you on iOS. It can place a pause on your entire Gmail inbox, once you’ve added the account, so you don’t get interrupted with a flurry of work emails while you’re eating dinner. Quiet for Gmail is an interesting alternative for Android users: It works like a Do Not Disturb mode specifically for your inbox. You can set different quiet times for different email accounts, and it even lets you carry on using the official Gmail app as normal. More and more apps seem to be opening up to the idea of letting users snooze notifications to a certain time. The Samsung SmartThings app, can silence smart home alerts during the day. Meanwhile, tools just added to Instagram and Facebook let you see how long you’re spending in the apps as well as letting you mute notifications for a period between 15 minutes and 8 hours. If you find some app is bothering more than you’d like, have a look at its settings to see if some kind of scheduled quiet time feature isn’t available--or at the very least temporary mute. As for global snoozing of alerts across all your apps, there’s no compelling option besides the Do Not Disturb features now built into Android and iOS. What options there are appear on Android, where developers have a little more scope in terms of controlling system notifications and the behavior of other apps. AppBlock, for instance, is primarily designed to block access to apps when you want to focus, but it works for silencing notifications until the time of your choosing too. You can set it up to work on a schedule, but it’s also able to operate by location too, so you can snooze your notifications until you’ve left the office. The downside is you can’t use the apps at all while they’re muted. Do Not Disturb is a third-party notification muter for Android that you might prefer to the built-in options. The app can work on a schedule, and will even operate automatically based on a calendar linked to it—if you’re serious about creating a completely customized alert muting routine, this is worth a look. Special permission to interrupt you can be granted to certain contacts that you always want to hear from.